‘Vogue,’ the iconic public magazine is among the top rated magazines in the world. Even you must have seen it among the top selling magazines list. 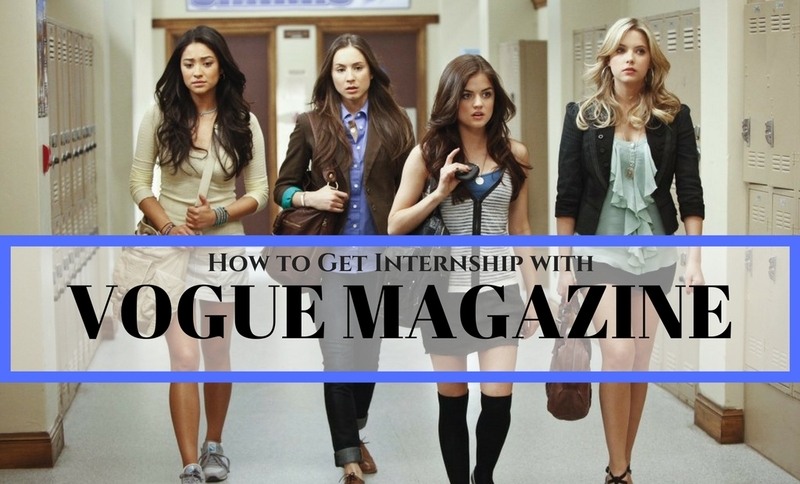 But do you know that just like other reputed organizations and corporates, Vogue does offer internship programs to students who aspire to be a part of this awesome publication. If you too dream of getting a summer internship with this fashion behemoth, then this is possible but it is too competitive. So, if you want to take up the golden chance of getting through the Vogue internship program, then reading this post is a must for you! Vogue is a reputed magazine that is considered an iconic publication related to beauty, fashion, lifestyle, and trends. The first issue of this magazine was published in 1892 and presently the published circulation of this magazine is around 1.248.121. The main office is headquartered in US. It has been ranked the world’s top fashion magazine for numerous years. The edition of Vogue is available in 21 different languages, which itself shows the unbeatable popularity of Vogue. Vogue has always stood as an impalpable and eminent fashion guide for women of all ages and all across the world. With its exclusive style quotients, journalistic developments, and in-depth awareness to the masses about current development, the magazine warmly invites new and young talent possessing a high passion for fashion. It accepts innovative and impressive ideas in forms of its internship program, the details of which are mentioned in the below section. The internship program from Vogue lasts for 4 – 5 weeks and runs mainly through mid-April till mid-August. The up-to-date details about the same are available on the Vogue website. It is an unpaid internship for the first 3 months. Students who are selected to be a part of this internship must be available 4-5 days prior beginning of the internship course. During the internship duration, one is asked to work in different sections or departments related to advertising, corporate, editorial, documentation, publications, and more. Besides this, Vogue organizes comprehensive seminars, workshops, and lectures for the interns. You might be able to do lots of hard work but if you are able to make it then you can have a really rewarding and amazing career throughout. If you are concerned about the roles and functions you would be allotted as an intern in Vogue, then you would be glad to know that the interns in Vogue are treated with due respect and care. The internship functions and duties may vary but are not limited. Some of the prominent duties of interns include maintaining official documentation, performing errands, organizing shoots etc. The interns are mainly enrolled in the following departments – Corporate, Editorial, and Advertising. Vogue belongs to the Conde Nast publishing company. In order to get an internship in Vogue, you are required to follow some steps. You need to check the Vogue’s website to know about the internship program. This is the most sorted solution to consider and identify the availability of internship program of Vogue. There you will get all information about the paid and unpaid internship programs through their online career section. Even the website will also help you to gain more knowledge about this magazine, its history, and its past and current trends. Also, you can have a look at the writing style of the magazine. There are various sections on the website and one of them is the ‘career section.’ You may click on the career section and it will redirect you to a new page. There you may check for the up-to-date career program and requirements of the magazine. You need to click on the internship program link on the website to fetch all the details you need. In order to apply for an internship in the Vogue magazine, you need to submit a resume as well as a cover letter online. It is essential to write a brief resume about yourself, focusing mainly on the assets and skills that you think will be useful to the magazine. You can also search for the opportunities in the listings of the job. Such submissions will also help you gain additional details, like transcripts, pictures, and essays. Also, you require a profile picture to be submitted with the resume. When you are applying at Vogue for the internship, then make sure your resume is specific and don’t just talk general. Since it is a fashion magazine so you must write and show experience related to the industry. If you will send a general resume that is not able to showcase your skills as per their requirements, then you will end up with a rejection. If you don’t want to miss the golden opportunity to get hired to the internship program of the Vogue magazine, then you must have a clear idea about what they do and this must be reflected in your resume. Since they are the ones who are influencing the fashion to a great extent, so they are very particular about their hiring and employ only the experts. So, make sure your resume is impressive enough. If you are among those individuals who can speak fashion and who consider designers and fashion to be an integral part of the lifestyle, then there is a possibility that you will be able to make through the internship interview. Vogue covers the upcoming and latest seasons as the biggest part of their magazine. If you think that you can make a difference, then only you are suitable for the Vogue internship program. Vogue is a reputed magazine, and hence, there is intense competition involved in order get through its internship program. So, be prepared to face the intense competition when you are applying for the Vogue internship. It is essential to present only your best skills and abilities and stand out as an expert. The internship interview for the Vogue magazine is similar to interview for any other job profile. Seek the interview as the chance to present your proficiency and knowledge. Make sure you research well about the magazine and possess a deep understanding of the latest fashion trends, latest stories, and articles of the Vogue magazine. Prepare yourself to answer various questions about the magazine as well as related players. There would be numerous typical questions asked in the interview, like why you want to work in that company, what all you can bring to them and why hiring you would be the best decision. After few days of the interview, you must take a follow-up. Don’t act pushy in this regard and be polite to whatever decision they have made. Focus on your desire to work for Vogue and don’t be surprised to know if they have selected you in order to make a decision. If this is your dream internship then do all possible things in order to get through the interview process. What are the Benefits of Vogue Internship? Vogue is a highly reputed magazine dedicated to provide interns an excellent educational experience. When you are hired as an intern in Vogue, then you are deemed as part of the magazine’s corporate world. This will offer you the opportunity to get accustomed to the top-notch team of marketers, sellers, and editors. Another awesome benefit of getting hired for the Vogue internship is to get hands-on experience in various fields like editorial, advertising, marketing, and more. With this magazine, you will be able to work in varied departments as well as get to know how a magazine company actually works. Professional training is another added benefit of getting hired to the Vogue magazine internship. It is a fascinating world to work in and as an intern, you will be exposed to various divisions and forms, including even some world famous celebrities. Hence, the professional training that you will get there will definitely be an asset to you throughout your life. In fact, for such reasons, Vogue ensures that every individual they appoint is a matured and multi-tasking personality. Being working in one of the world’s top fashion magazine, you will have the advantage of meeting and communicating with the top fashion experts. As a result, you can develop your own great sense of personal style. You would always be surrounded by amazing fashion freaks and feel proud to be part of a reputed publication. During the internship course, Vogue organizes numerous events, seminars, and workshops. This is an excellent opportunity for the interns to get familiarize with the interns as well as the multi-media business. Last but not the least when you are interning with Vogue then you can mention this brand name in your resume, which is enough to give a great kick start to your career in the advertising world and the fashion industry. Even if you are not able to work in the company for full-time, still you will be able to grab a great job with handsome salary if you have a resume mentioning about the Vogue’s internship program. Getting an internship with the Vogue magazine is not an easy task. But honing few skills help you get there for the very first time. Make sure you develop a practical approach towards your work. There will be more times to work late hours than working in a relaxed environment. Be prepared for this and make sure you do your work dedicatedly. Vogue is a huge branded magazine, which is highly strict about its deadline. Hence, if you too possess this skill and are sure that you will be able to efficiently meet the strict deadlines then you are just perfect for this job! Even if you don’t possess all the skills required from an intern at Vogue, still it is vital that you are proficient in what you do and the skills you possess. Also, you must be able to execute your skills well in accordance with the demand of the situation. There might be lots of ups and downs during your internship program in the company. But make sure that you develop a positive attitude towards all the obstacles. Your positive attitude will help you go through all the tough times during your internship program. Besides having expertise in your specific field of the internship, it is important to have detailed information about the industry as well as other vital aspects related to the fashion world, such as travel, entertainment, art, jewelry, lifestyle, and more. Also, you must have the skills to present each aspect in a captivating manner. Getting an internship with Vogue is a tricky task. But if you want to be there then besides everything mentioned in this post it is essential for you to possess strong determination. You need to be ambitious, skilled, and different from the crowd to get hired in Vogue. You never know if your internship may land you to a full-time employment with the company. So try hard and you will definitely make it! Previous articleHow to Use Google Alerts in Your Job Search Effectively?